A few weeks ago I homemade my own Indian Clubs and over the past couple weeks have been testing them out in my workouts both at home and at Discovery Park where I hold my Synergy Kettlebell Boot Camp. Let me tell you that they definitely bring a different element to training, one that will never replace my kettlebells, but for a change up and some variety fun they are certainly good to have around. For an overall great conditioning and fitness experience you should always change up your program with new movements and progressions to those movements. Unless you are specifically training for an event or competition the varying workouts are what will keep your body challenged and changing. They'll also keep you from getting bored with what you're doing. Ok so back on topic. 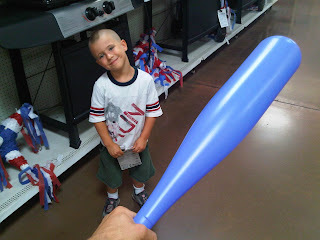 The Indian Clubs are so easy to make and they're pretty inexpensive too. Commercial versions are probably easily 10-20 times the cost. I spent about $10 on each of the ones I made. Personally I don't need anything fancy or pretty when I workout. I just need it to work and function how I need it to. In comes my Fat Bat Indian Clubs (pictured below). 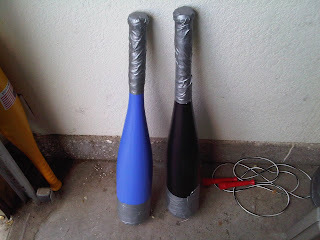 Ok so, how did I make my Fat Bats into really cool looking and workable Indian Clubs? Good question and I'm gonna tell you. Yeah so you noticed that one bat is yellow and in the first finished Indian Club picture above there's a blue one. Why is that? 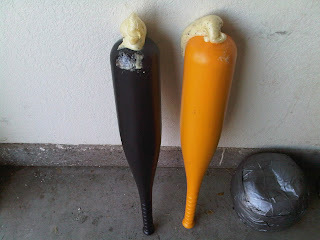 Well I accidentally made both the yellow and black Fat Bat Indian Clubs a bit too heavy for me at this time. I then had to go back to Wal-Mart (yup that's my source... shhhh... don't tell anybody) and get the blue one to make it a bit more manageable so I can grow into the black and yellow ones. 1. Fat Bats purchased from Wal-Mart for $4 each. 2. 1 can of Great Stuff from Wal-Mart for $3. 3. 1 bag of play sand from Home Depot for about $2. 4. 1 25lb. 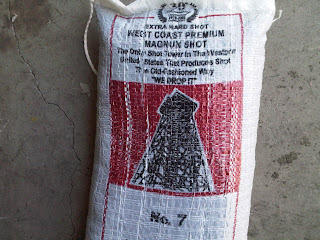 bag of shot purchased from Sportsman's Warehouse. I absolutely love this place. 5. 1 blue funnel, but I'm sure any color funnel will do. 6. 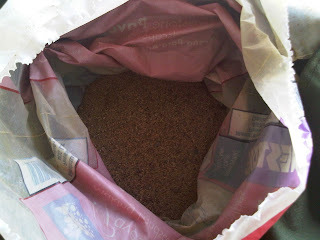 1 white sand scooper. Note: I used the hammer, pliers, and screwdriver only because I don't own a drill and if you do I would recommend using it to bore the hole in the top of the bad instead of my method, but either way works. I grabbed the bats and burrowed a hole in the top so I can pour in the sand. Since I didn't have a drill to make things easier I got a little workout hammering and pinching the top open with the screwdriver and pliers. 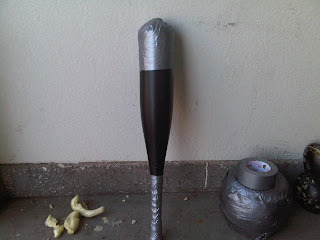 I used the screwdriver and hit it into the Fat Bat with the hammer. As soon as I had a few holes in the top I grabbed my pliers and peeled back the top so I had just enough room to fit the funnel spout into. Then I put a couple holes right next to the hole for air to escape when I poured in the sand and shot. Ok so now that you have the hole in the top here comes the easy part. Put the funnel in the top and use the white pour cup and put in the sand to a height of your choice. If you filled the entire Fat Bat with sand the weight would be approximately 20lbs. If you want a lighter bat don't fill so high and then stuff in some newspaper or old ratty shirt as filler so the sand doesn't move around too much. If you want a heavier bat you can pour in as much shot at you want. 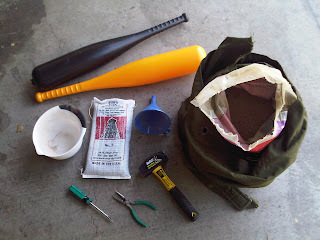 What I did with my first 2 bats was equally fill them both with sand and then equally used the bag of 25lb shot. This made them about 30lbs or so. I didn't weigh it yet as I don't have a scale at home, but estimated by balancing the Fat Bat Indian Club with one of my closely weighing kettlebells. I didn't care about exactness in this batch, but was simply going for an equal amount of sand and shot to be tossed into each. My second version was more on manageable weight so I can successfully train with it as designed. Yup that's the stuff that makes it all happen. This is awesome stuff and just be careful cause it gets pretty messy. It's almost like a one time use can cause it just keeps on coming out and coming out. Don't get it on your hands because it almost instantly sticks and then clings to any and every particle of anything you touch. My hands looked like I hadn't washed them in 3 days after this project, but I swear I did. I'm kind of a germ-a-phobe so I wash them quite often. When you're done with your Fat Bat filling leave about a 2 inch gap from the top of the hole. 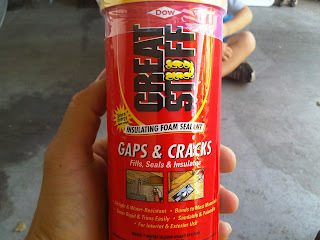 Spray the Great Stuff in the hole and fill any crack and crevice inside and then leave to sit for about 24 hours. They will look like the below picture when dried. Pretty cool looking huh? Once it dries you aren't gonna be getting that out unless you drill it again. It seals so well. I wish I can put this stuff in my wife's mouth sometimes. Ha! Just kidding Lisa!! :) SERIOUSLY!!! I'm kidding! Okaaaaaaay... SO once you've allowed it to dry overnight and have it look like this simply take a razor blade and trim off the excess so that it's flush with the top of the bat. Then clean up the top so that all Great Stuff is wiped off from the plastic. Now it's duct tape time! 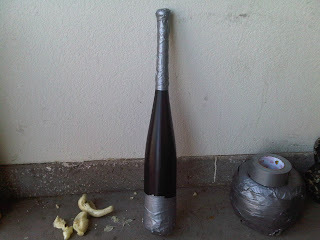 Wrap the top of the bat so that there's absolutely no way anything will pressure itself to leak out. Then wrap the handle so it's of the thickness that you like. I made mine just a little thicker than a Pro-Grade Kettlebell handle which is 32-33mm. This seems to work very well and makes the Fat Bat Indian Clubs look really cool too. These are the finished products and now my new toys. If you make some let me know if you have any questions and what cool workouts you come up with. I've been practicing my Fat Bat Indian Club swings, swipes, mill presses, and some other fun right alongside my Kettlebell and GPP work. The Indian Clubs are great supportive movements for pretty much any program. And they also work great if your kid smarts off- as seen below.